Kundalini Yoga is best experienced when practised in a group setting under the guidance of a qualified teacher. The group energy increases the effectiveness of the practise and the unified experience of the group consciousness can only be experienced with others. So come along and get involved…If you have any questions please feel free to get in touch. 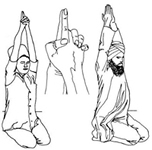 A Kundalini Yoga class will begin with chanting the mantra Ong Namo Guru Dev Namo three times. This mantra means, “I bow to the Creator, to the Divine Teacher within.” Tuning in with this mantra sets and calms the mind. It also connects us to the ‘Golden Chain’ the energy lineage of kundalini yoga for guidance during the session. Following this the teacher may also chant the mantra Aad Guray Nameh, Jugaad Guray Nameh, Sat Guray Nameh, Siri Guru Dayvay Nameh three times. This a a common Kundalini Yoga mantra used for protection. It means “I bow to the Primal Wisdom, I bow to the Wisdom through the Ages, I bow to the True Wisdom, I bow to the great unseen Wisdom”. In each class we do a kriya, which means ‘completed set’. This is most commonly a combination of pranayama (breathing), asana (yoga posture & exercise) and mantra (chanting). Each kriya is done in a particular sequence and for a specific amount of time to create a desired effect. After the kriya there is a period of deep relaxation in savasana or corpse pose (pictured above). This posture allows the body and mind to relax completely and gives space for rejuvenation of spirit. In a typical class following the relaxation there will be a meditation. In kundalini yoga there a literally thousands of meditations taught by the Master, Yogi Bhajan. These vary in length but may be as short as 3 minutes or last as long as 62 minutes. Meditations vary in form using various mantras and mudras (hand/arm positions). We finish each class by singing a song called Long Time Sun and then chanting the manta Sat Nam three times. This song of blessing helps to ground you, to integrate the benefits of the yoga, and to prepare you to resume the activities of everyday life. Sat Nam is a very common mantra used in kundalini yoga. It means “My true identity is infinity.” “Sat” means essence or truth, while “Nam” means name or identity. Avoid eating a large meal two to three hours before class. Wear loose comfortable clothing. Natural fibres are best as they allow your skin to breathe. White clothing is the prefered choice to project and cleanse you aura. Many Yogi’s also wear a headcover (white) to contain energy in the crown chakra during practice. Bring a yoga mat (or sheepskin) to work on and a blanket to cover up during relaxation or to cover the spine and avoid chills. Bring a water bottle and drink small amounts often during a class, especially if it is strenuous. It is best to do yoga with bare feet. This allows the nerve endings to exchange energy into the atmosphere. Cultivate the habit of going a little beyond your limits, but not to the point of injury. When you cannot continue an exercise, rest a moment, and then resume. Often meditations in kundalini yoga can cause some discomfort through holding a static posture. It is best to hold the posture unless it is not causing physical damage. The pain will pass and this increases the effect of the meditation. Women should avoid strenuous exercise during the first three days of their period. They should also avoid a specific yoga breathing technique called Breath of Fire, as well as inverted postures such as Shoulder Stand. A gentle approach is best during your menstrual cycle and also during pregnancy. Pregnant woman, should avoid Breath of Fire and Shoulder Stand, and any exercise done on the stomach.